The Questions You Ask Can Change Your Life! so you can change yours too. It was 5:23am on a snowy Ohio Saturday morning. I had just moved to Ohio from the warm south-east USA and was still trying to learn how to drive in the snow. Turns out, it was not my driving. It was a message I needed to hear. I landed in a ditch with the tires spinning. I was on my way to do a few skilled nursing visits as it was my turn to work the weekend. The first thought that came to my mind was, why am I in this ditch, where am I going? Why could I not be in my bed like most normal people would be at 5:23am on a Saturday morning? You see, the questions you ask yourself can change your life. The day I landed in the ditch, I made myself a promise that I would start my own home health care company so people who like to get up early in the morning would work for me and since then, things have changed. That was almost twenty years ago. I started my first agency without doing all the “right things” and having all “the correct systems”. I had zero dollars and zero cents…no credit, no loans, no lines of anything…just sheer guts. I started with $1,263 dollars and in 36 months, I had grossed over a million dollars. Over the years, I have learned a lot, got fed up quite a few times, made a ton of money and now I teach nurses entrepreneurship. I love my work and I enjoy my career and I will share my wisdom, advice, recommendations, lessons learned, great wins and successes when and if you need me to. Can’t find what you need here on my website? Call 440-942-9933. Let Me Challenge You To Become A Nurse Millionaire! The 100 Nurse Millionaires Challenge shows you how to earn an extra thousand dollars to launch a caregiving business and then grow that business to a million dollars in 36 months without loans, lines of credit nor a huge working capital. Join the challenge and become the next nurse millionaire. Launch Your Agency In A Weekend! A business building and business launch 2 1/2 days intensive for those nurses who choose not to pay franchise fees nor licensing fees and those who would rather not invest a huge amount of money to start a caregiving business. Yes, launch your caregiving business with no franchise fees, no licensing fees, NO HUGE WORKING CAPITAL NEEDED. A free course shows you how. Learn more! -Patricia Graham, RN, President Ideal Care Providers, Columbus Ohio. As a reporter once described it, The Elder Care Cliff Report column is like Dear Abby for caregiving but better because when you read it, you feel like you are not alone plus you get real answers, practical and actionable steps you can use right on the spot. Every newspaper should subscribe to this column. 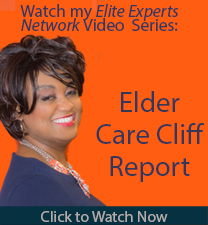 Request 3 samples of the Elder Care Cliff Report..
As featured on CNN, CNBC and Fox News, this is the program that shows nurses how to start and build a million dollars business starting with just a thousand dollars. It is a weekly mentorship program for nurse entrepreneurs who aspire to be millionaires working for themselves and making a great difference in the world. Visit our online school to learn more. Born to speak and has never met a stranger, Stella Nsong is building the bridge to transform America’s Elder Care Cliff through education, and public speaking. 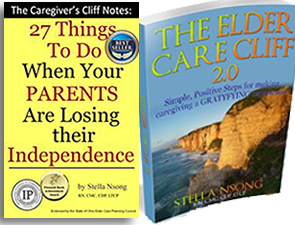 Her books, lectures and seminars offer road maps to surviving caregiving and to help America prepare for the year 2030 when the youngest babyboomer will turn 85. She is the obvious choice for designing your eldercare workplace program. Download her speaker one sheet and learn more here. How Nurses Get Rich Without Winning the Lottery!